Not every independent author can afford to replicate the traditional publishing process, but at Kazoo we can help you to improve your book within your budget. We provide a comprehensive publishing service; choose the package that suits you and you can avail of additional services as you require them. With each of our packages, your cover design is included. You will work directly with one of our designers to create an eye-catching and attractive cover. You will receive one worked-up cover proof and you can make unlimited corrections to that design. All design files will be supplied to print and digital specification, and you will also receive a web-optimised image and a 3D render of the book cover. Seven layout templates are included in each of our packages for you to chose from. If you would like your book designed differently from our templates, Kazoo will be pleased to discuss a custom layout with you. In today’s market an online presence is essential for every author. Kazoo offers a full web design service, giving you complete control over the look and feel of your site. If you wish to retail your book directly from your site, e-commerce packages start from just €50 extra. If you already have a website or blog that you want to redesign or upgrade to reflect your new book, contact us to discuss your options. 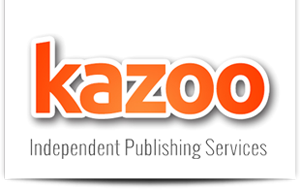 In our members’ area, accessible to all Kazoo authors, we have a suite of documents detailing how to promote yourself and your book online and in the traditional media. We cover who to approach and how to approach them if you are aiming for national distribution to bookshops. We offer a professional author consultation service to assist with all aspects of your work whether you produce your book with Kazoo or not. We can help you with plot development, writing technique, editing, sales and marketing/PR. This is a top-level service delivered by experienced industry professionals.